assuring repeat accuracy. Also ideal for special machine applications. (104CJ, 108CJ) Programmable roll feed, 99 job storage, feed advisor, feed complete signal, Data Instruments and Link Press control compatible, batch count, adjustable speed, acceleration/deceleration. Wide range of accessories, higher speed than CJ Series with the convenience of 115 VAC. (106TX, 112TX, 118TX) Choose the performance you need (refer to performance charts). Air pilot release and mechanical pilot release available. Entrance guide roll or cascade roll available. Driven upper roll available. and driven upper roll standard. Air regulated feed roll optional. larger diameter rolls and the ability to feed up to 48" wide material. 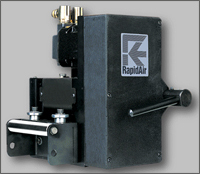 (KBXP104S, KBXP108S) Programmable roll feed and flat stock straightener combined in one unit. All the features of a 100S Series plus the extra power to straighten .090 thick C.R.S. The KBX may be used as a Servo Feed alone by merely raising the straightening rolls. Patent pending. Similar to KBX100S Series but with air pilot release. Patented. Note: KBX Series provide floor space saving by eliminating the material loop between feed and straightener.